I return from another session with the postdocs trying to get them performance-ready for the big January show where all Beijing postdocs will entertain each other for an afternoon of song and dance acts. Despite the effort I had remained unconvinced that reciting nonsense poetry was the best option. This decision was confirmed when it was suggested that translating the poem into Chinese may make things easier for the audience to understand. I came up with an alternative for them in case they really did want to perform something in English and so, a little after lunch today, I found myself standing in front of a dozen theoretical physicists singing Monty Python's the galaxy song. Another of life's strange experiences indeed and, fortunately, not as unpleasant for me as it might have been a few months ago. 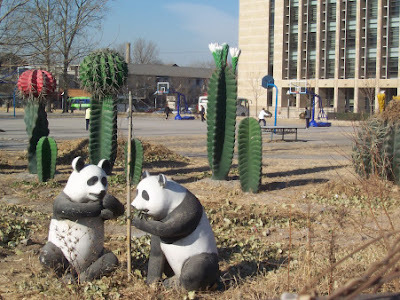 It was probably unpleasant for them and they agreed that it was probably too complicated to learn in the next couple of weeks and so will find a Chinese number to perform instead. Perhaps a wise choice. Anyway, apart from that and a very enjoyable evening spent last night chatting with some American's and a Scot in my apartment building over some fine Mexican food and a few beers, work has been almost non-stop. Saturday I was working till late in the evening though again in the pleasant surroundings of a cafe near to Tsinghua. 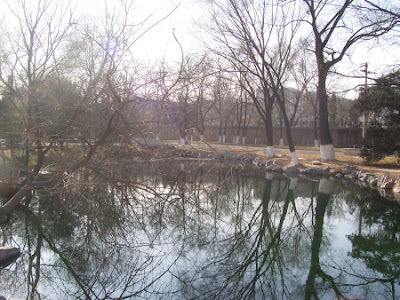 I did get away for a few hours on Sunday to go to Beida (Peking University), and in temperatures well below freezing, spent an enjoyable, relaxed time strolling round the fine century old grounds. Beida, Tsinghua and Nankai university joined and moved down South during the War of Resistance Against Japanese Aggression. According to the museum it has been a center for both cutting edge science and forward thinking since its founding and many key incidents in China's recent history have been linked to the student movements and academic power of the institute. On the way to the grounds I passed basketball players running around in around -6 in rather surreal settings. The famous lake at Beida will become an ice-rink soon but for now it makes for a pleasant, quiet setting. Anyway, to complement the CAS site is the atmospheric optics site which has a similarly stunning range of photos and great explanations to go with them. The bulk of photos on this site are related not to the often chaotic world of cloud effects but to the fantastic, symmetric patterns which, if one is lucky, can be seen produced by light reflecting and refracting from ice crystals suspended in the Earth's atmosphere. Generally I will only write an explanation of physics or mathematics if I think I can explain it any more clearly than the source in which I've found it. 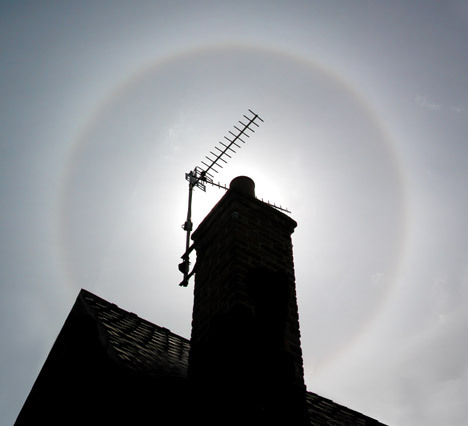 In this case I suggest having a read through the discussion here as to the formation of the most common phenomenon, the 22 degree halo. Occasionally the conditions are just right so that the whole sky can be illuminated with a complex display of arcs, halos and sun dogs. See this photo for the best display I've found. Anyway, I'll be looking out for good conditions to get photos of some of these effects, especially over the winter in Korea and Japan. The second half of the Winter school in Korea will be at a ski resort so I hope to return with some good shots. John Baez wrote a bunch of posts on forms of ice; I don't know if he had any one particular summary post. You could try the thread associated with this message. Thanks, that thread has most of the information I was thinking of but I do seem to remember a TWF on the topic.